Happy sheep lunching under the solar panels. Photos courtesy of Norwich Solar Technologies. The Upper Valley Aquatic Center (UVAC), in White River Junction, Vermont, has to deal with energy loads many people might never think about. For example, the center’s pools put a lot of water vapor into the air, especially as people are splashing about in them, and that vapor has to be removed to eliminate the discomfort and other problems associated with high humidity. The traditional approach to this is to operate equipment that requires a lot of electric power. Richard Synnott, UVAC’s Executive Director, addressed the cost of dealing with humidity with the help of a very impressive, high-efficiency ventilation system that reduces electricity usage. But that is just one big load. He has known for years that the center could save money each year by having its own solar array. So he looked for a solar installer, and because non-profit organizations cannot take advantage of incentives, he also had to find a way to finance the system. In time, Synnott settled on Norwich Solar Technologies (NST) to provide a turnkey solution for the array. He did this partly because it was very nearby, but also because of recommendations he had received. NST located and purchased nearby land for the solar system and did all the design, permitting, engineering, and construction work. They worked with New Energy Equity of Annapolis, Maryland, for financing. The Upper Valley Aquatic Center’s solar array in Hartford, Vermont. The UVAC array was built in Hartford, Vermont. As a 500-kilowatt (AC) system, it is expected to produce about a million kilowatt-hours of electricity per year. It has 2,184 solar panels, REC 335 Twinpeak 72-Series, and fourteen CPS inverters. Because of the financing of the project, UVAC did not have to spend any up-front money at all. Over the time that New Energy Equity owns the system, it will save the aquatic center about $25,000 per year. At select dates during the contract period, and the end, UVAC has an option to buy the system at a much-reduced price. 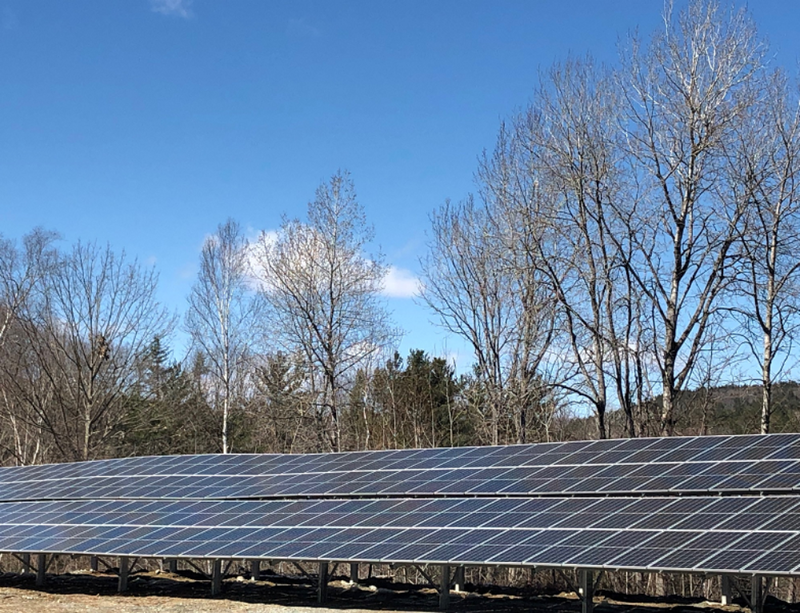 The system is net-metered with Green Mountain Power, and the estimated savings over the first twenty years of operation come to about $800,000.